Here's something a little out of the ordinary for me but something I truly love and have a growing concern and passion about. Being green. And as Kermit said, that's not so easy. Enter: Squeaky Green: The Method Guide to Detoxing Your Home . I should stop right here and tell you that I married into a pretty "green" family. I might as well have been blue for all the ways we were compatible in this department but slowly and surely I'm comin' round. It might have something to do with the fact that we live on the west coast which is notably more concerned about being green than other parts of the country. It could also have something to do with having born children onto the planet and having a desire to keep them as healthy as possible. At any rate, we try to do our part in a reasonable manner. Now WHY do I try and do my part to "live green"? Fear? Absolutely not. Because someone told me to? Never. Because I want to? Yes, mostly. Why do I want to? God created the earth, said it was good and established man as the caretaker of it. So it's not just that I want to, but I also believe it's my responsibility to be a good steward of what God made and what He entrusted to us. I know various people have various reasons but that is mine. That said, I also trust God to take care of me AND the planet and don't believe its going to collapse on me if I DON'T work and make plans and efforts to keep the place a little cleaner. Certainly I can make not only my life more unpleasant, but others also, by ignoring the fact that things naturally fall apart. I don't really care to speed up the process or make the living conditions more intolerable. 1. They offer practical lifestyle changes and applications to creating better living environment for yourself and your family. And when I say practical, I mean really, really practical (and free!). Things like taking off shoes when you come inside the house so that you aren't tracking dirt and dust mites all over the place for everyone to breathe in. Here's a tip: When the weather is agreeable, open your windows and doors and air the place out. It creates better air quality within your home. They mention things like washing your bedsheets on a regular basis to remove dust mites that trigger allergies and respiratory problems. Also they suggest using things like hydrogen peroxide when you want to whiten clothes instead of bleach. Free to cheap ways to better your living areas. 2. They are not out cracking their whips demanding that their readers adapt all of their methods to cleaning. They state the obvious - it can be expensive to live green. Therefore their tips are practical and they suggestion things that the strictest, tightest budget can handle to advice you can implement if you want to go "all out" on living a more organic lifestyle. 3. The book is organized by rooms. Under each tab you can find tips for how to detox your home from the bedroom to the bathroom, kids' rooms to pets. It's nicely organized and easy to follow. Now, as the full title of the book suggests, the authors are particularly fond of Method cleaning products (which you can easily find at Target). I'm not so much a fan of Method although I have used their hand soaps in the past. Personally, I much prefer Seventh Generation cleaning products. One of the biggest threats to good health within the home are the cleaning products that we use. The authors of this book state over and over again (it's practically their mantra) that if you can smell it (i.e., the cleaning supply leaves a lingering strong odor) then you might as well be eating it. They offer valid and practical reasons why this is so. (Not scare tactics, just the facts!) The fumes and cleaner themselves can affect your person and I do believe that there are healthier ways that we could choose to go about cleaning our homes. Now organic, biodegradable cleaners CAN be more expensive. Or can't they? I bought a can of Comet cleaner before December which was always used in my home when I was growing up. By the end of December, after the parties and guests, the can was completely empty. I had decided to forego buying more Comet and make the switch to Seventh Generation toilet bowl cleaner once this can of Comet was all used up. I've cleaned three toilets in our home twice with this bottle of toilet bowl cleaner and you can barely tell that I've even opened the bottle! I wasn't sure how much to use so I didn't put much cleaner into the, er, john, right away. Because Seventh Generation does not use any dyes I could clearly see WHAT I was cleaning and that I didn't really need much cleaner at all. (This is, of course, opposed to Comet that is blue-ish green and makes everything inside the pot completely invisible.) I'm using less cleaner of a more environmentally friendly nature and the cost really does even out in the end. It might be more of a bigger upfront investment, but in the end the budget is not hurting and neither is the environment in which I am living! 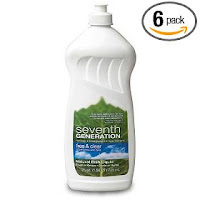 I also gave up on Lysol spray cleaners and made the switch to Seventh Generation All-Purpose Cleaner. The air quality is improved after cleaning (I always hated the smell of Lysol and I don't want to think about why. ), it costs about the same and lasts just as long. It's worth it. Same goes for their dish washing detergent and laundry detergent. One of the tips in Squeaky Green is that you know you are using too much detergent when you can smell it on your clothes. You just need to get the clothes clean - not drench them in chemicals which then rub off on your body. Ok, so I've said a lot but not as much as Ryan and Lowry in Squeaky Green . And for the practical helps and tips? Check out Squeaky Green . This sounds like a great book. We consider ourselves pretty green, but I do have my limits, so I like an approach that's realistic. It's hard for me to believe that 5 years ago I barely recycled. Today, I'm the one hounding others to be more paper aware, to recycle more etc. It's so nice to come visit the blogs from the Bloggy Carnival now that I have time to both read and comment. 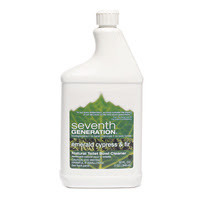 You can also buy Seventh Generation at Bed Bath and Beyond for a good price. Take in a 20% off one item coupon and it gets sweeter and I have those all over the place. I read that book! Both Mr. Shortcake and I are westcoasters and come from big "green" families. In my family, we'd get in SO much trouble if we threw paper or carboard into the trash! :) Have you tried Method products? I HAVE tried the Method products (thanks to Target for making them a bit more popular) but didn't really care for them. I didn't so much mind the smell of them at first but grew to dislike it. I can't smell Seventh Generation - thus I prefer it. Rachelle - thanks for the tip re: BB&B! Thanks for pointing me to your review. I'll keep this title in mind--I think you'd really like the one I'm reading now, too! I've never tried Seventh Generation--will keep my eyes open for what we can purchase around here.